Starring Ben Affleck, Henry Cavill, Gal Gadot, Amy Adams, Ezra Miller, Jason Monoa, Ray Fisher, Jeremy Irons, Diane Lane, Connie Nielsen, J.K. Simmons, Ciarán Hinds, Amber Heard, Joe Morton, Lisa Loven Kongsli, Ingvar Sigurdsson, David Thewlis, Sergi Constance, Billy Crudup, Joe Manganiello, Marc McClure, Robin Wright and Jesse Eisenberg. Screenplay by Chris Terrio and Joss Whedon. Distributed by Warner Bros. 119 minutes. Rated PG-13. Zack Snyder has turned the DC comic universe into a big slog. Snyder sort of took over the superhero franchise from Christopher Nolan (The Dark Knight, The Dark Knight Rises) with the reboot The Man of Steel, in which he sapped all the life and humor out of Superman, essentially turning it into a Greek tragedy with aliens. This continued into his follow-up, Batman v. Superman, a joyless slog through super-mythmaking which was almost as excruciating for fans as it was for the heroes. The rot continued with Suicide Squad – which Snyder did not write or direct, but he did help to guide. The first glimmer of hope came this summer, when the big-screen treatment of Wonder Woman turned out to be mostly a good-hearted and entertaining big-budget blockbuster. Again, Snyder didn’t make the film, but at this point he oversaw this particular universe, and Wonder Woman was created with an eye towards her appearance in Justice League. Even though he gets directing full credit here, Snyder had to leave Justice League in the middle of filming due to a horrific tragedy; the death of his young daughter. I have nothing but the most complete condolences for Snyder, no man should have to deal with that kind of dreadful loss. Really, it is a terrible, terrible thing. However, despite the horrible, tragic circumstances that led to this change, Zack Snyder leaving Justice League is probably the best thing that happened to the film. It’s still not perfect – there is too much of Snyder’s DNA in the storyline for that – however, I will bet that most of the watchable and enjoyable aspects of the film stem directly from the mind of his replacement, Joss Whedon. And there is much to like here. Imagine that, a comic adaptation that allows a comedic pulse. 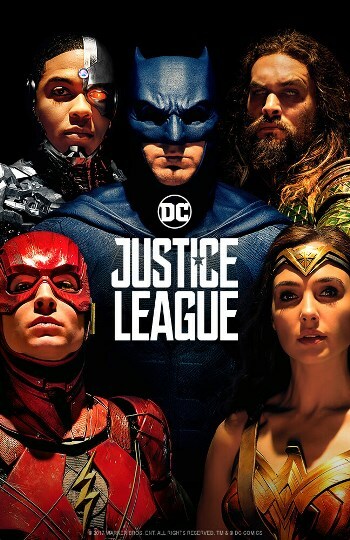 So, while Justice League still has a lot of the grim storyline, a pretty awful bad guy, has a few too many ridiculously violent fight scenes, and even stole the basic storyline of some Marvel films (the fight over supernatural boxes which have the power to destroy the world), somehow the whole thing still mostly works. Somewhat surprisingly, the character that works best in Justice League is the one that has barely seen any time in the DC films to date – though he does have a TV series on the CW. I will admit, The Flash has always been my favorite DC character anyway, but it is quite amazing how he buoys the film, even though the character is mostly there for comic effect. I was originally a little disappointed that Snyder pointedly refused to hire TV Flash Grant Gustin to play the role on the big screen, but Ezra Miller did a terrific job in a slightly different vision of the role. Also, somewhat new to the team was Jason Mamoa as Aquaman. Mamoa had his moments in the role – although the new Aquaman is very different than the original comic incarnation – but he did not bring as much to the table here as the Flash. Also, sadly after her feature film breakout, Gal Gadot’s Wonder Woman is given significantly less to do here. She is very good in the role, I just wish it had been fleshed out a little more. As for the big guys, I still think Ben Affleck makes a better Bruce Wayne than he makes a Batman, but he is just fine in the role. Henry Cavill still makes for an awkward Superman – he’s got the look down but not the attitude – but at least here he is allowed a little more humanity (Kryptonity?) in Justice League than he has in the last two films. He even smiles sometimes. Pretty hard to believe after two films in which Kal-El was played as a joyless, miserable slave to his superpowers. All in all, Justice League, while far from great, gives me hope for the DC comic universe. If they keep in mind that these stories are all based on comic books and not Shakespearian tragedies, and they continue to let a little light sneak in through the oppressive dark, these films have the potential to compete with the Marvel films for pop culture ubiquity. Copyright ©2017 PopEntertainment.com. All rights reserved. Posted: November 17, 2017. Tags: Amber Heard, amy adams., Aquaman, batman, Batman v Superman, Ben Affleck, Billy Crudup, buffy the vampire slayer, ciaran hinds, Connie Nielsen, Cyborg, David Thewlis, Diane Lane, Ezra Miller, Firefly, Gal Gadot, Henry Cavill, Ingvar Sigurdsson, J.K. Simmons, Jason Monoa, Jay S. Jacobs, Jeremy Irons, Jesse Eisenberg, Joe Manganiello, Joe Morton, joss whedon, Justice League, Lisa Loven Kongsli, man of steel, Marc McClure, movie review, PopEntertainment.com, Ray Fisher, Robin Wright, Sergi Constance, superman, The Flash, Wonder Woman, Zack Snyder. Bookmark the permalink.